It often takes weeks and months before women realize they are not well, and that the symptoms they experience start having detrimental effects on their functioning, perception, and relationships. Sometimes a menopausal woman might notice the symptoms, but she is too shy to tell her family or simply does not know where to seek help. It is dedicated to providing women suffering from mood disorders with adequate resources, education, and support. Their questionnaire contains 14 questions and the scoring system rates the answers from zero to five, when there is no depression, up to 21 in case of a severe depression. It is one of the most renowned medical centers in the US, investing numerous resources in the mood disorders research program, as well as mental health clinical trials. Their depression quiz has 16 questions and uses a 27-point scale to evaluate depression. It is a non-profit organization based in the US, assisting those suffering from mental health illnesses with a special focus on inhibiting their progression. Their depression test consists of 10 questions, and the results are based on a 27-point scale classifying depression from mild to severe. It is a national program, created to help women quit smoking and promote cigarette-free lifestyle. Based on the fact that smokers are more likely to suffer from depression than non-smokers, they offer a 14-question depression quiz that allows women to evaluate themselves and, if needed, seek help. When choosing an online depression quiz, it is recommended to first verify its sources and preferably select those created by mental health specialists. Several of the organizations we reviewed also offer mental health services in their local communities, so they can provide you with guidance and necessary resources. Although helpful in making the first step towards diagnosing depression, these assessment tools should not replace a proper evaluation by a mental health professional. However, if you are still not ready to see a doctor after taking the quiz, perhaps taking advantage of numerous free depression helplines can clear up any uncertainties. 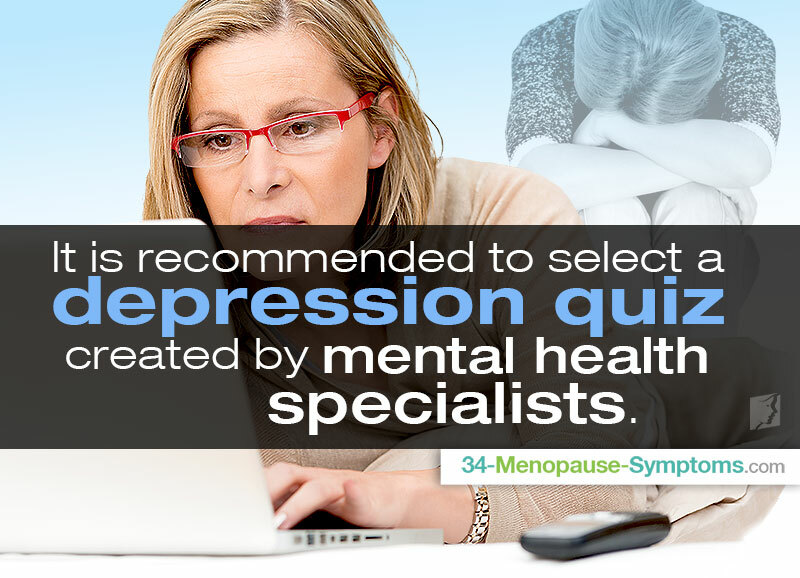 You might also be interested in learning how to distinguish between depression and mood swings, both of which are common during menopause. How Does Depression Affect Your Work?